It is possible to have a natural hospital birth, but it is becoming quite rare sadly. There are also some things that you can do to make labor and delivery less painful. The interesting thing is that these are largely the same techniques! Obviously the two main ways of having a pain free labor are an epidural or an anesthetic. Both of these options carry significant risk to both mother and baby (1, 2, 3). There are however natural ways to lessen (and in some cases eliminate) the pain of labor. While giving birth at home or at a birthing center can be the best way of ensuring you have a natural childbirth, the vast majority of women in the U.S. give birth at the hospital (over 98%!). Achieving a natural birth in hospital is possible, but you need to be prepared to fight for it. Sometimes, women choose a hospital birth for medical reasons or if they are a high-risk pregnancy. Other times, there are no other options. Birthing centers are few and far between in more rural areas, and some states outlaw home births attended by midwives. 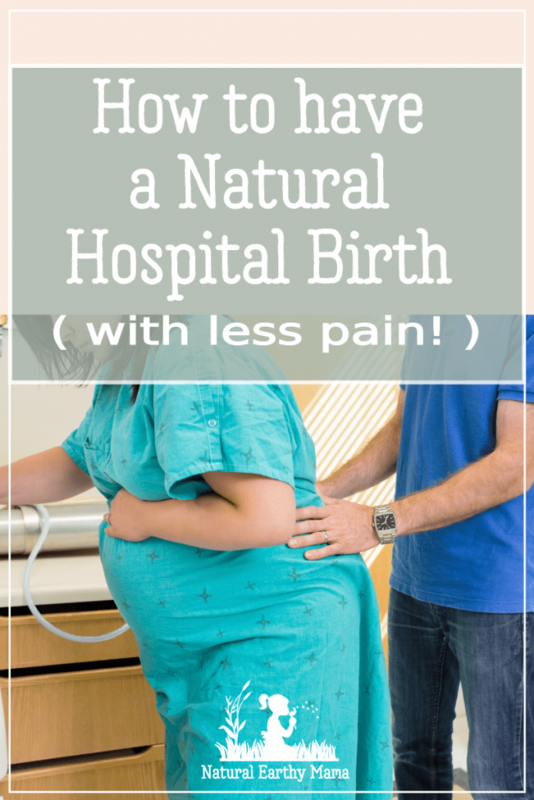 A natural hospital birth can absolutely, 100% be done! Sadly it is true. Our medical system has become one of efficiency, money making and avoiding being sued. This may sound harsh, but it’s better to be prepared if you want a natural hospital birth. Most hospitals and doctors specialize in interventions. This is great if you NEED emergency or specialized care, and there is no doubt that they do save lives. However, we know, one intervention like Pitocin can lead to another intervention like an epidural, which could ultimately lead to a c-section. This is known as ‘The Cascade of Interventions’. According to the World Health Organization (and a millennia of women birthing before us), over 90% of women can have an unmedicated vaginal birth. This means that your natural labor it is not only possible, but probable if you’re prepared! Women who want a natural hospital birth need to be strong with their choices. You do need to be happy to work against the system. 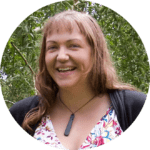 If you are still on the fence about the benefits of a natural hospital birth PLEASE read Ina May’s Guide to Childbirth. It has helped many mamas who were on the fence about natural birth embrace it. Talk with your partner. 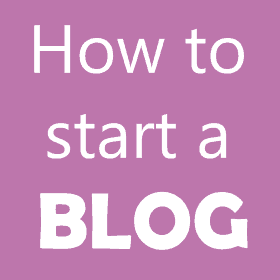 If your partner is not on board you will need to explain to him why you want a natural birth. Many people just don’t know why natural birth is so great and why trying for one in the hospital is more difficult. Surround yourself with other natural birth advocates and stay away from negative voices. Remember that over 90% of women can have a vaginal and unmedicated childbirth. Read our amazing natural childbirth stories. Stay positive and know that many scary stories may have started with unnecessary interventions that you can avoid. If you have a choice of hospitals, it’s a good idea to research your options and try to find the most natural-minded practitioners. Other Moms and doulas are the best resources for finding the right place to plan a natural hospital birth. Is the hospital baby friendly? Ask them what their c-section rate is. Are there any restrictions on who is allowed in the room? How does the hospital support breastfeeding? Do they have an International Board Certified Lactation Consultant (IBCLC) on staff? Can I walk and move around during labor? Do I need continuous fetal monitoring, even though it isn’t evidence-based? Can I stay in the same room the entire time? Can I choose what position I deliver in? Can I have access to a birth ball? Can my partner stay with me after the baby is born? How open is the hospital to natural, unmedicated birth? How do I decline interventions? Also, take a look around at the birthing rooms. Would you like to be in labor there? Are they homey? Do they have soft lighting or comfortable beds and chairs? Do they have natural birthing accessories like squatting stools, large bathtubs, birth balls, etc. If for some reason you can’t deliver at home or in a birth center, or if you don’t live near enough to one, check and see if you a hospital near you has a birthing center. The difference between the two is subtle but important. A free standing birth center doesn’t have obstetrical surgeons (OBs) or advanced medical care available in-house. This means if you do need a c-section, you will have to transfer to the hospital. A birth center in a hospital does have access to emergency medical treatment if needed but are still primarily run by midwives, usually nurse-midwives. Yes, the midwives have to follow hospital protocol, but you probably have a better chance at your natural hospital birth in one of these birth centers than in a hospital maternity ward. However, buyer beware! These days, many hospitals are calling their labor & delivery units “Family Birth Centers.” Generally, these are not birth centers at all but normal labor & delivery units with all of the interventions that come with them. A true birth center within the hospital will have obvious signs that it’s different–maybe a queen size bed, a big tub, and the inability to get medical interventions without transferring to a regular labor & delivery room. Hospitals have realized that the demand lately is to “go natural” and have changed their marketing to fit the bill. Choosing your health care provider is probably one of biggest indicators of the likelihood of a natural birth. Some health care providers are in to natural births, and some aren’t. Your chances for achieving your goal are increased if the people taking care of you are on the same page. Interview your health care provider closely, and if, at ANY STAGE you no longer feel comfortable with their care, you have the ABSOLUTE RIGHT to ask for someone else. Generally speaking, midwives are more likely to result in a natural birth, and OBGYN are more likely to have interventions. However, this does vary from practitioner to practitioner, ask for their individual statistics. A doula can make a huge difference in whether or not you can have a natural hospital birth. Not only can your doula help be your advocate for an intervention-free birth, but studies show that a doula at your side during labor increases your chance of spontaneous vaginal birth without vacuum or forceps assistance. Women who have support from a doula are also less likely to have any pain medication or epidurals, vacuum or forceps-assisted births, C-sections, or negative feelings about childbirth. Your husband, your partner, your mother, your sister—these people aren’t professionals when it comes to birth. They know you. Doulas know birth. Together, they make up a powerful support team! There is no better way to prepare for birth, especially a natural hospital birth, than to take a good pregnancy and birth class. Sadly, many of the classes offered by the hospital are more about how to be a good patient, and what medications are available than how you can work with your body to give birth naturally. Seek out classes that include how labor and birth work and natural labor pain management techniques, such as breathing, self-hypnosis, relaxation and other coping mechanisms. Your hospital probably offers an evening or weekend course, but that might not be enough information, especially if they have a high epidural or C-section rate. Instead, research independent educators. Try a few different classes or styles until you find one that feels like a good fit. Hilary from Pulling Curls offers an amazing antenatal class that you can do from the comfort of your own home. Women who have lower interventions during pregnancy set a precedent for going low-intervention during labor, too. If you don’t have any particular health problems, opt for fewer rather than more tests, treatments and interventions during your pregnancy. Some tests are important for every mother, but many are entirely optional. Whenever tests or procedures are recommended, ask why you need it, if it will change or improve your health or if you’d be just fine without it. If your doctor or midwife provides compelling reasons why you need certain interventions, then get them. They’re there for good reason, but not every patient needs everything, but at the end of the day, it is your health and your choice. Eat well, following a healthy pregnancy diet, and keep up your exercise. These will help to ensure you are at peak performance for the work out that is labor and delivery. Women who labor at home longer, have lower interventions once they get to hospital. While you are at home you can move around, get in the tub, eat and drink and go for walks. When your contractions are consistently less than five minutes apart and getting stronger for at least a couple hours no matter what you do, then you can check in with your provider. If you go to the hospital and you’re not very far dilated, go home again. If you sit around at the hospital, it is likely they will suggest giving you something to hurry labor along. If you want a natural hospital birth with less pain, this is NOT what you want to happen. The medications that they give to augment labor increase the strength of the contractions, while at the same time overrides your natural pain relief mechanisms. The strength of the augmented contractions can be enough to send your baby in to distress, this is especially the case when you give in and get an epidural as well. A baby in distress is very quickly progressed to needing a c-section. Water has an amazing ability to naturally reduce pain levels during labor. A shower, bathtub, birthing pool and hot compresses are Mother Nature’s tools for easing pain and helping you relax. Spend as much time as possible in warm water. Many women choose to birth in the pool as well. The water helps aid movement (through buoyancy), relaxation, a feeling of safety and calm, and it supports the perineum. All this combined means that a women is more likely to have an intervention free birth, with less pain and less or no tearing. Breathe, meditate, relax, move, change positions, get a massage, listen to music, whatever it takes. You know yourself best. Do what feels comfortable in the moment. Hypno-birthing is a self hypnosis technique that is shown to reduce or totally eliminate birthing and labor pain. HypnoBabies is the one that I used, and while I didn’t really use it much in labor, it was amazing to help me rest and sleep during my pregnancy, helped with a lot of my aches and pains AND it helped me visualize my birth to the point that the whole thing played out exactly as I had imagined. Right down to labor starting at 3am on a Sunday morning so that it was all finished and tidied up before my girls got up at 6am (home birth!). It was a beautiful thing, and I credit to the visualizations during self hypnosis. Many hospitals expect women to stay lying on a bed strapped to a monitor for the length of the labor. This is NOT how our bodies were designed to birth. Stay upright, sway and move. If you must be hooked to a monitor, see if they will do it intermittently, or give you a mobile unit. The standard hospital labor position—semi- or fully reclining—is not ideal. When you’re lying on your back, your uterus compresses major blood vessels, potentially depriving the baby of oxygen and making you dizzy or queasy. In addition, when you’re reclining, the baby’s head puts pressure on pelvic nerves in your sacrum, increasing pain during contractions. Remaining upright and leaning forward reduces this pressure while allowing your baby’s head to constantly bear down on your cervix. The result? Dilation tends to occur more quickly. Here are six labor positions to try. Have one leg squatting, and the other kneeling, this is great to open the pelvis for deliver. Kneel and lean on your parter, a couch or the bed. Get on all fours on the bed, a yoga mat or on the floor, try and keep your chest above your bottom. One of the best best best things you can do to encourage a natural, low pain birth is to RELAX. Cortisol and adrenaline (the stress hormones) will reduce the natural flow of labor. So strong are these hormones that they can actually stop labor all together. They also disrupt your body’s natural pain relief and contraction producing hormones. Originally this was a good thing. Women viewed birth as a natural process, and it was not to be feared. So if a tiger arrived, they would panic, labor would stop and they could run and hide. Labor would restart when the woman was safe and relaxed. Unfortunately, today our doctors or hospitals are often what we view as the tiger, and our bodies have to try and labor in spite of this. There is a reason that labor often starts at night, it is when we feel safe and relaxed. Keep your birthing room warm, dark, gentle and relaxing. Ask people to use soft voices, and move gently. Respecting the peace in the room goes a long way towards letting a woman feel safe and calm. This is the BEST space to give birth naturally in. Being calm and respected allows your body to progress as it needs to safely. You need to feel safe, secure, and supported. Armed with the knowledge you need, and to have a healthy and strong pregnancy. If you do these things, your chances of a natural, normal hospital birth is greatly increase. As is your chance of less labor pain. I wish you all the best on your birthing journey. Some good tips though it’s interesting. I am on my second pregnancy and with my first child I simply said, “no, I don’t want an epidural or any drugs at all.” That was it. I went to the hospital when the contractions were 5 mins apart and had a completely natural birth there. Nobody fought it. In fact towards the end I started to break under the pain and asked for something but they reminded me that I had asked not to be given anything. It must be different in Canada where i live, but there was never any forcefulness. I was there labouring away with my support team until I began to push; they caught the baby and everything was fine. Good to get these tips though, I will have to take a shower with this second birth!